Land Where I Flee is full of religion, especially Hinduism, that special kind of Hinduism the upper castes practise – discriminatory, self-righteous and impenetrable. I am often asked why religion plays such a prominent role in my novel and in The Gurkha’s Daughter, my collection of short stories. The glib answer? Well, they are books about South Asia so what would you expect? When there’s so much of it around you, you just plaster your books with it and hope for catharsis. Or something. I grew up in a Hindu household next to a protestant church and went to a school whose leanings were heavily Buddhist. So, yes, I was surrounded by a lot of religion as a child – at school, where devout teachers took weeks off for a sermon with the Dalai Lama; in the Sunday School lessons at church that my parents encouraged me to attend; and in my grandfather’s bath-time incantations, decibel increasing as the water’s warmth decreased, that we awoke to every morning of our vacation. I learned about religion in many contradictory ways – the Sunday School teacher talked about there being only one God, which wasn’t what the cobweb-ridden altar at my home with its many-limbed statuettes corroborated – but the learning was never forced. God and religion were inseparable. God was easy to comprehend – someone who was always looking out for you. Religion was often difficult to grasp. God and religion came together in delightful harmony during festivals – in the fireworks and the worshiping of cows, dogs and crows at Diwali or the Christmas tree and Santa during Christmas. Then, of course, adulthood happened, and God and religion often took on bleaker connotations, not just in terms of wars waged on account of religious differences but in everyday interactions. Whether in America, India or the UK, whether they were Hindus, Muslims or Christians, it was pretty much the same. At my college in Midwestern America, I was exposed to a different kind of fundamentalism. The nicest people descended on my dorm room to offer a ride to Wal-Mart. Dinner invites came from nowhere. All wonderful things, no doubt, and what I attributed to the average American’s large heart. Until the generous favours were expected to be reciprocated with trips to the church. “Which church in Kirksville do you attend?” an elderly lady would ask. “I don’t,” I’d say. “The way you say it, I can sense you know you’re doing something wrong,” came the concerned reply. Hennah, my landlady for my first term at Oxford, insisted I was a Muslim at heart and with increasing frequency slid under my door a hillock of anti-Christian and anti-Jewish paraphernalia. “Jesus was not a Muslim,” one of the cute pamphlets read. When I told her that someone I knew was half-Muslim, half-Hindu, she accused me of being blasphemous. The three-month lease never got renewed. Back in India, at the gates of the famous Jaganath Temple in Puri, a white friend and I were refused entry because we didn’t look Hindu enough. I’d probably have passed muster if my Hindu-ness hadn’t come under suspicion by virtue of my being with a white person. When I declared I was a Hindu, I was asked for proof. Upon my last name giving my caste away, there were repeated expressions of contrition. The damage had already been done, though. After the experience, I stay away from big-name Hindu temples, even if the architecture might appeal to me. I have always felt better connected to a higher power at Buddhist monasteries than I do at other places of worship. I still remember the high triggered by my three-hour uphill trek to the Paro Taktsang, a monastery precariously perched on a hilltop in Bhutan. I felt my soul was purged. Of course, back then, I was not so familiar with the atrocities committed by Bhutan when it kicked out 106,000 people from within its borders on ethnicity- and religion-based differences. The spiritual high I had experienced now feels incongruous with the place that perpetrated such serious ethnic cleansing. The knowledge is bound to taint a future trip to this monastery. So, yes, I write about proselytising Christians, about burqa-clad Muslims and ‘bigger’ and ‘smaller’ Hindus. I write about Hinduism’s many evils, about the significance of 84th birthdays and of the trauma inflicted on menstruating women in religious households. I write religion into my books because religion troubles me. It scares me. I am envious of people who use it as their crutch. The one way I try to make sense of religion is by writing about it – about the rigidity of the caste system, about the draconian nature of some rituals, and about people for whom religion is life. Perhaps one day I will tire of ruminating about religion and stop feeling victimised by it. Until then, I will continue being bothered by it, and I will continue using my writing to try to mitigate the anguish it causes me. 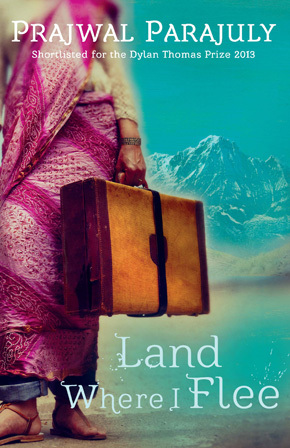 Land Where I Flee is published by Quercus in hardback and eBook. Read more. 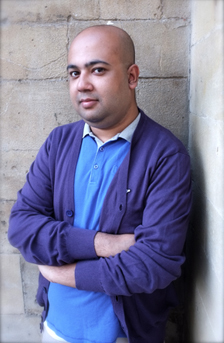 Prajwal Parajuly, the son of an Indian father and a Nepalese mother, divides his time between New York and Oxford, but visits his hometown Gangtok in the Indian Himalayas at every opportunity. Parts of Land Where I Flee were written while he was writer-in-residence at The Oxford Centre for Hindu Studies. His story collection The Gurkha’s Daughter is published by Quercus in paperback and eBook.